East Coast Jets Flight 81, a BAe 125-800, departed Atlantic City (ACY) at 08:13 EDT on a flight to Owatonna (OWA). The airplane was cleared for an approach to runway 30. Runway 30 is a 1676 x 30 m (5500 x 100 ft) ILS equipped, concrete runway. The crew apparently decided to execute a go around. Eyewitnesses reported that the plane struck aerials. It came down 2400 feet past the runway end and cut a swath through a corn field. Weather at Owatonna at 09:55 included: wind 170 degrees at 6 knots, broken clouds at 3700 feet, temperature 19 degrees C, pressure 29.83. PROBABLE CAUSE: "The National Transportation Safety Board determines that the probable cause of this accident was the captain's decision to attempt a go-around late in the landing roll with insufficient runway remaining. 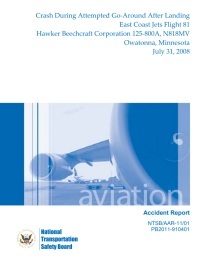 Contributing to the accident were (1) the pilots' poor crew coordination and lack of cockpit discipline; (2) fatigue, which likely impaired both pilots' performance; and (3) the failure of the Federal Aviation Administration to require crew resource management training and standard operating procedures for Part 135 operators." Distance from Atlantic City International Airport, NJ to Owatonna Airport, MN as the crow flies is 1618 km (1011 miles).